The proliferation of internet usage and the upsurge in the creation of so many websites has led to the development of an entire science devoted to the understanding of the patterns online. Most users are comfortable with the idea of interacting with a non-human structure, the website, which is giving them access to information and allowing them to conduct different operations. The website is like a portal that opens up a range of possibilities for the users. There are a lot of different kinds of static and dynamic websites, which allow varying ranges of interaction and entertainment. Usually people do not realize that at the backend of their internet usage and browsing is being recorded in different statistical forms so that the website owner could know more about the visitors on the website. This systematic approach to finding out more about users of your website is broadly known as web analytics. Through web analytics there is an attempt to gauge how the website content affects the users and how the users respond to different types of stimuli on the web page. Monitoring the users’ activity and the site’s performance are some of the most important functions of web analytics. In order to find out about the online activity of the users, their preferences and their tastes, web analytic tools are extensively used. Market research is another area where this data is extremely relevant. Web analytics basically refers to the usage of web data for analysis and understanding of online patterns. For web analytics, the data is collected, measured and then interpreted. Web traffic is gauged and measured by using different types of instruments. The number of people who visit a website and the type of activity they conduct while using that website is recorded consistently so that the website developers can analyze which aspects are interesting and which ones need to be modified. Web analytics is used to assess the effectiveness of the content placed online. An area where this study of web traffic is gaining widespread popularity is that of e-commerce. Businesses use this information as an easy and cost effective way to conduct large-scale market research without directly bothering their existing or potential customers. Advertising is another area where this data becomes extremely relevant because a business can assess and measure user response directly after the introduction of a new ad or offer. The data also provides gainful information about the demographics of the users and this information can be used to inform the operational decisions of the firm. Such type of a research has implications for what the business produces, what it sells, how it sells and to whom it sells. Broadly, the types of metrics measured by web analytic instruments include the number of people who visit a website, number of pages viewed, number of clicks, etc. This type of collection and assessment of data measures the general online performance of a website regardless of whether one owns or maintains it. The popularity and the attention the website gathers on the internet outside the sphere of the website’s own operations is measured by off-site web analytics. This information provides a guideline regarding the status of the website on the internet, its audience, visibility and buzz. >This type of data strictly deals with the information that is collected when users visit a site and how they interact with different elements present on the web pages. The duration of their stay and the translation of their interest into purchases or subscription can also be measured. One can also find out about the landing pages, which entice the buyer into making a purchase. On-site web analytics are particularly important for commercial purposes where businesses want to know exactly the worth of their investment. 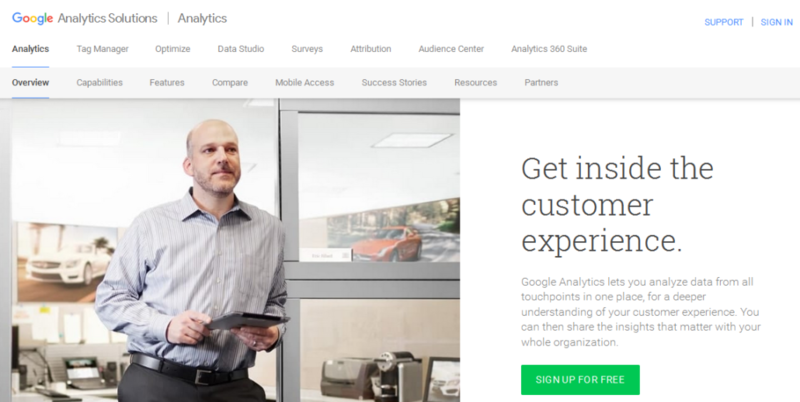 The most widely used tool for measuring on-site response of users is Google Analytics. Websites that deal with the provision of a lot of content, textual or otherwise, did not have a clear-cut means of finding or knowing how much the discourse available on their website was worth. In business terms, measuring the return on investment of content has been made possible by using sophisticated web analytics. In order to gauge the worth of your website content, qualitative and quantitative analysis are both important. Quantitative analysis gives information regarding the numerical and statistical value of the content by telling the business what the users do, while qualitative analysis will help the business see how the users engage with the content. It can tell you about the purpose of the user’s visit and the effectiveness of your content. Web analytics allow website content developers to get great insights into what to present to the users in order to increase their web traffic. Web analytics can be used in the realm of content planning in order to find out which type of items or elements might be problematic or redundant. Using this data, it becomes easy to compare and review one’s own performance with the performance of a past period. It becomes easy to use these numbers in order to sketch out a trend of growth for your business. If the website is not getting enough traffic and your business is considering a serious remodeling, web analytics can help you understand whether this might be a viable investment or not. Websites can also find out whether their users are satisfied or not. Those who create the content will obviously be interested in knowing how successful it is because they can use this knowledge to make decisions about the future content they produce. Marketing is an important area that is affected by the results of web analysis. Website owners can clearly find out how users are reaching their website, i.e. through another website or a different link. This way, they can use these channels to market their products and services. For instance, if a clothes retailer gets most of its users redirected from its Facebook page, then it is safe to assume that marketing on the Facebook page should be more rigorous. In order to calculate whether an advertising campaign was successful or not, websites can make good use of insightful data from web analytics. Web sites usually function as international portals of information and they can discover the geographical location of their visitors by analyzing data. This way their strategies and content can be modified to suit the cultural, ethical or personal characteristics of the users it attracts. Figure 1: Taken from http://faculty.ist.psu.edu/jjansen/academic/jansen_website_analysis.pdfIt is imperative for website owners to gauge the performance of their website based on the metrics displayed in the table above. Knowing the visitor type is significant because there are some people who visit your site for the first time while others are regular. Calculating unique visitors and unique sessions is equally important for the website. The unique visitors were calculated by using cookies and this helped analysts to trace individual consumer behavior. However, the second approach in which unique sessions are calculated is more suitable for commercial needs because in each new session a business can market its product or service to the users, whether those are new or a regular visitors. Average time on site is another way of measuring the amount of time visitors spend viewing the site content. The measurements used include finding out about users who stay for less than 5 seconds and those who spend more time. Different intervals are used, but the basic aim is to ensure the duration of the site visit is long. If the visitor has spent a short period of time on the site, it means that the user did not find relevant content or reached the site by accident. This can then be traced back to the sites that referred the user to your website and you can easily tell which sites are referring irrelevant traffic. Internal search is another way that websites try to find out more about their visitors. Internal search is basically the facility offered to users to allow for site specific searches, i.e. you can search for the content by typing your query. This data can be used to tell websites about what products/services to offer, which products should be made more accessible, what most customers prefer, what issues they face, etc. The website can make personalized offers and even use the exact words of the customers/users in its titles. Here is another significant tool for understanding how users reach your website and what they do once they reach it. It is important for e-commerce firms to know about possible problems in the path of a user selecting an item, placing it in the cart and making the final purchase. Another approach to understanding this is to have in mind that the users’ actions are not all logical and they can be random. The only way to understand the visitor path is to trace it back to the last page the person was viewing. On different websites, people at present usually go through a number of articles or items before clicking on something. This understanding of the visitor path allows the content developers to present better material to the users. Top pages are another metric, which include top entry pages, top exit pages and most popular pages on the site. It is intuitively easy to understand why optimizing content on top entry pages and most popular pages is essential, while the top exit pages allow the content developers to identify and eliminate the problems users are facing. The analysts can also align the business goals with the top pages, i.e. if the top pages are the secondary pages on a website and they do not really help increase the sales then the purpose of the business is not being achieved. Other significant metrics include referrers, which help a user reach the website. This can include search engine results, a link on another website, a link on a blog, through social media sites, personal bookmarks, etc. If the referrer is not bringing in enough traffic then perhaps you need to think about the placement of the link. Keywords are another very important tool that helps content developers find out about the most searched words and phrases, which they can then include in their own content in order to get more traffic. Lastly, identifying errors is extremely significant in ironing out the problems or flaws of your site because otherwise people will be discouraged from using it if they frequently get errors when the page loads. Log-file analysis was the earliest type of web analysis, which stemmed from finding out about the number of hits a webpage received. During the mid-1990s page views, request for viewing a page and visits/session, i.e. requests from a unique user after every 30 minutes period of inactivity, were also used as measuring instruments. Web counters were also extensively used on websites, which showed the number of times the website had been visited. In the log-files method tracking, files were saved on the webhost’s server, which helped in collection of the user data such as time spent on a site, number of pages visited, the last viewed page or exit page etc. The log-file method was common because it was cost-effective and affordable for companies to extract information in this manner. Log files exist regardless of their usage for web analytics so nothing has to be modified or added on the website to record information in this way. The software needed to read these log files is merely a one-off expense and there are no additional costs of web analysis. Cookies were also assigned to users and the website could gain valuable information about unique visits to their site. However, this method has had serious issues related to user privacy because the unsuspecting visitor unknowingly agrees to the use of his personal information without consent. Companies use this information for research and but occasionally the information is sold to other commercial giants for advertising purposes. This approach therefore has gathered negative publicity. Typically, there are two types of cookies used, first party cookies and third party cookies; the former are used by the website itself to record user behavior, while in the latter case another external company is collecting and collating this data for analysis. Other techniques include the usage of Ajax code, which relays information about the user to the web analytics company. Third parties can also analyze web traffic and this would require the user’s computer to conduct a Domain Name Server look-up. Page tagging is beneficial in an additional way because it gives information regarding incomplete forms, video viewership and usage of mouse on the website. Geolocation determination is increasing in importance because websites want to tailor their content to meet the needs of their users. Even though a globalized world has led to an increased similarity in tastes, there are still vast differences and cultures, economic backgrounds and lifestyles that need to be accommodated by businesses. If a firm receives most of its visitors from a particular region then it will be intelligent to design its content and offers to cater to the customer base. Internet Protocol Intelligence technology is used to find out about the visitor’s country, region, city and postal code. The type of connection, identity of the Internet Service Provider and proxy information can also be deciphered from this technology. Using this information, it has become easy for businesses to do market segmentation and behavioral targeting. For businesses that have a local presence geolocation analysis is a great tool because they can redirect the website users to their physical outlet. The patterns of a user’s clicks on a website are measured within this category. Websites at present are not just static HTML pages. They consist of images, galleries, videos, multiple links and several sets of pages with varying levels of interactive elements. Website owners are interested in knowing what users commonly click on, so they can then probe into the reasons behind greater attention being given to some elements over the other. Things like placement of objects, sequences, navigation, text style and visibility, color and design can all be assessed by these metrics. If more users tend to click on something, it is obviously representative of their interest in that item. The click analytics process can happen in real time where editors tailor the content of the website immediately to garner more clicks. This can happen if there is a discount or sales offer on a website and editors manage the content in real time to attract as many customers as possible. Click analysis can also be done in unreal time, which gives a general picture of the performance of different elements on the website. Clicks are collected at the backend by logging the click when it happens or by considering that every page view is the result of a click. One of the most popular tools used by different websites and businesses for analyzing the web traffic is Google Analytics, a free service, using which websites can get insights about their users. One can find out about their traffic sources, conversation rate, etc. The return on advertisement, performance of referrers and success of email marketing can also be seen. It provides in-depth reports and motion charts for about 50 sites per user profile. Commerce related metrics such as revenue and sales are also presented. In addition, it provides tools for search engine optimization (SEO). In essence, web analytics is about collating and interpreting website traffic, which is receiving widespread attention from different circles. As more websites spring up, people want to know the return on their investment and they want to tailor their content to gather more online attention, which would obviously increase their sales or subscriptions. Marketing, advertising and e-commerce are some of the areas where the reports from web analysts are used. Web analytics is of two types, off-site and on-site. There are four basic metric categories known as site usage, referrers, site content analysis and quality assurance.